On any given day, you’ll find 18-year-old Ryan Burch anywhere from Lowers to Blacks, in the halls of San Dieguito Academy or on the beach at D Street spitting some game at some Riverside sophomores camping at San Elijo for the weekend. You may have seen the lanky goofy-footer gracing the pages of this magazine, boosting airs at Seaside or hanging at Church’s all day for his NSSA heats. The kid is everywhere and encompasses the best qualities of a super-charged, burgeoning grommet. Whether you're a big fan of the surfing scene or you're more often found mentally gearing up on poker strategies, you'll soon catch a glimpse of him in the local area. Expect to see more from Burch this year, next year and many years to come. Comp highlights in 2006: NSSA Explorer season champ for 2005-2006 and a couple of wins this year in Explorer Juniors NSSA. 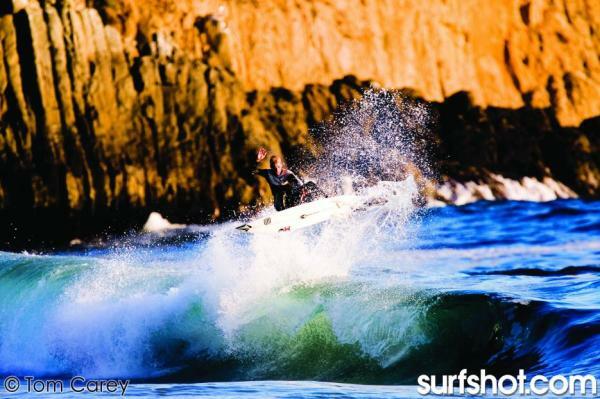 Who’s on your fantasy surf team: San Dieguito Academy surf team… Maybe throw Slater on there too. Crew: Snortum, Frad Hag, Sneed, Dave and Nick Suhadolnik, Billy Winslow, Cory G, Tanner Long, Thomas Clarke and other kids from North County. In 10 years: I have more questions than answers for that one. Hippie chicks or jock-ettes: Neither smell good. Seaside or D street: And everywhere in between. This entry was posted in Magazine, Profiles at Seaside. Bookmark the permalink. Ryan Burch and Eric Snortum with bare foam! rippin.